Singtel, in collaboration with Optus and Ericsson, has taken another step forward in bringing 5G services to the masses by successfully making an end-to-end 5G video call with augmented reality (AR) between Singapore and Australia. 5G test devices were used from Chinese consumer electronics provider Oppo, using a Qualcomm Snapdragon X50 5G modem on 3GPP-compliant 5G networks in both countries. “Once again, Oppo has pushed the boundaries of what is possible in a smartphone,” said Peter Huang, president of APAC at Oppo. "The call is another 5G first for Oppo, and demonstrates our commitment to become one of, if not the first manufacturer to commercialise a 5G smartphone. "We have been preparing for 5G technology for a number of years and have committed RMB10 billion (US$1.49 billion) this year alone in R&D investment as we usher in our 5G future. We are excited about what the next evolution of the mobile network will bring." The demonstration involved the use of AR on a real-time 5G video call, which showed Singtel and Optus engineers making instant on-screen annotations to exchange views on their respective live 5G sites, involving network equipment from Ericsson. The technology behind AR makes a more inclusive form of communication possible, opening up new possibilities for enterprises, ranging from mobile collaboration between experts in different locations, on-the-job training to remote assistance. Consumer applications for such services may include immersive gaming, virtual tactile shopping and holographic calls. This marks the latest efforts to bring the fruits of 5G technology to the people of Singapore and the wider Asia Pacific (APAC) region, with significant milestones achieved over the past 18 months, including the first Singapore 5G pilot in November 2018. In October 2017, Singtel and Ericsson launched the 5G centre of excellence programme, while more recently they co-launched the country’s first live 5G facility - the 5G Garage - in partnership with Singapore Polytechnic. The 5G Garage aims to act as a training centre, testbed and ideation lab to realise the innate advantages of the next evolution in mobile telecommunications technology, namely, increased mobile bandwidth and low latency, facilitating a broad range of new services, from telesurgery to autonomous vehicle and advanced AR/VR applications. 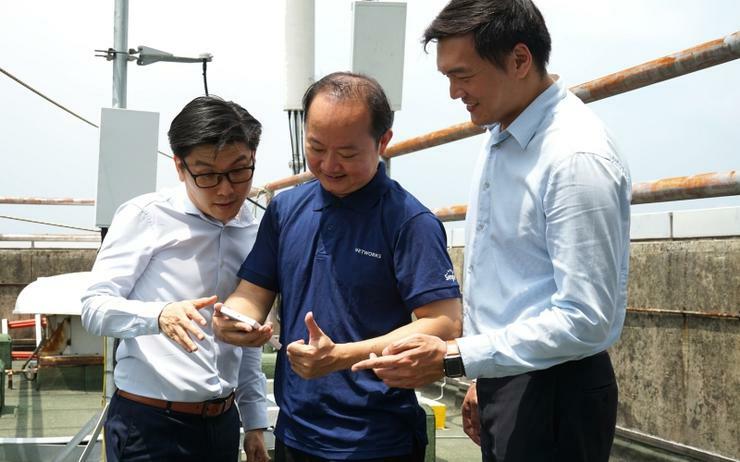 “This call is a significant marker in our journey to 5G as we develop a robust 5G ecosystem to ensure that our enterprise and consumer customers will enjoy an enhanced connectivity experience,” said Mark Chong, group chief technology officer at Singtel. “5G is a key enabler that will bring the future of AR, autonomous vehicles and smart cities closer to reality." More than just a neat gimmick, the idea of such services appeals to a significant proportion (76 per cent) of ordinary consumers, according to Ericsson’s “towards a 5G consumer future – consumer and industry insight report 2018." Furthermore, the study highlights that over one-third of users expect 5G to offer capabilities beyond speed and network coverage. This refers to improvements such as better battery life for devices, reliability, guaranteed quality of service as well as the ability to extend connectivity beyond devices to include the internet of things. “The success of this video call using 5G test devices and AR in a multi-party environment, brings us a step closer to having our mobile broadband experience transformed with a mere click,” said Martin Wiktorin, country head of Singapore, Brunei and the Philippines at Ericsson. “With the establishment of 5G connectivity on smartphones soon becoming a reality, consumers and enterprises will be able to unleash the full potential of 5G by integrating this new technology into their daily lives and operations." Furthermore, in Australia, Optus and Ericsson are partnering to build 50 new network sites and conduct critical interoperability device testing, allowing Optus to deliver a compatible 5G home broadband product to customers. “Once again Optus has proven our 5G agility, working collaboratively with our colleagues in Singapore to successfully land a ground-breaking 5G inter-country AR video call,” said Allen Lew, CEO of Optus. “Just last month we achieved another first, with the launch of our plans for our 5G home broadband product for Australian consumers and today’s announcement is another step in our commitment to lead 5G delivery in Australia."